Heartland is in need of monetary donations. Our medical, utility and labor costs are at an all-time high, and due to the economy, our donations are down. Operating expenses for the year exceed $130,000. P.O. Box 1149, Ottumwa, IA 52501. Your donations are tax deductible. Certain donation amounts give you the distinction of being a supporting member! The membership year is October 1 to September 30. If you would prefer to donate supplies, instead of a monetary gift, there are items that heartland is always in need of. The items listed below are our greatest needs at this time. Those items listed in bold type are the most urgent needs. This year will mark the 15th year that heartland humane society’s doors have been open to the communities needy dogs and cats, puppies and kittens. Some may remember our humble beginnings in a small building on highway 34 next to Champion Bowl. From there we expanded into the waste management facility on Fox Sauk Road, where we currently reside. Neither building was ever intended for housing large numbers of animals, and the structural limitations have always been a challenge for those who have worked with the countless numbers of animals that have passed through our shelter on their way to a better life. As our building ages and deteriorates, the task of keeping it clean and maintaining the drainage system, grounds, kennels and interior become increasingly more difficult and time consuming. When added to the basic care of the animals, which includes feeding, bathing, exercise, socialization, evaluations, medical treatments, etc., the demands of the shelter become monumental for the small core staff that exists to meet the challenge. 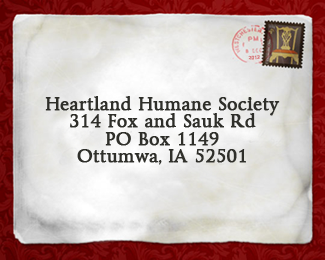 Heartland Humane has survived for all these years without the benefit of any regular funding from federal, state, or local government. Our budget is close to $130,000… A figure that surprises many, but is understandable when one considers the needs of payroll, veterinary care, utilities, supplies, maintenance of the building and grounds, and food. Our adoption fees, private donations, fundraisers and occasional small grants are the means with which we stay in operation, though many months our budget shows a deficit balance. Without question, we would not be in existence today without the incredible outpouring of love and generosity of our friends in this community and beyond, who recognize our desire to meet the needs of so many homeless, abandoned, and neglected animals. Besides food, supplies and donations, we are in critical need of volunteers, foster care participants, and a handyman or two. Every donation is greatly appreciated, no matter how small. Again, we couldn’t do any of this lifesaving work without your support and we thank you for your continued kindness.